This page gives a brief description of what the units are about. 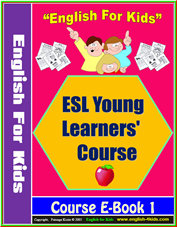 Click on the each unit's icon to access the over 300 exercises and young learners' resources this book has to offer. Each unit has : Printables worksheets, Flashcards, Powerpoint presentations, Video presentations. Some units have puppets, mp3 song audio and song book and more tools you need to deliver a fantastic lesson to ESL/EFL Young Learners. There is something in here for everyone, even for those who just want supplementary materials. Aim: Teach letters of the alphabet and sounds through a phonics approach. Letters and Sounds of the alphabet – provide a continuous resources base for all phonics based lessons through the courses. Resources: Practice tests papers. Listening 1 and 2 audio, vocabulary test worksheets.